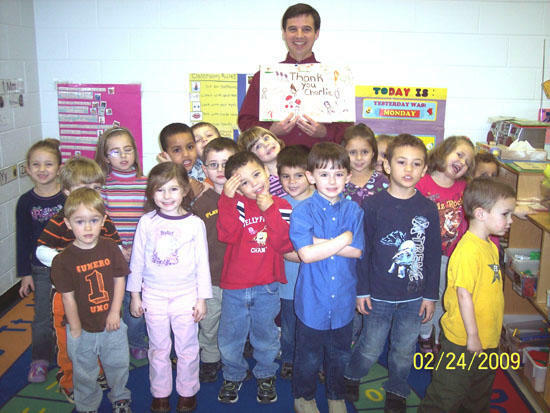 Charlie Neese of News Channel 5 was the guest reader for the 2009 RIF Campaign. Mid Cumberland Head Start in Cannon County is beginning our annual Reading Is Fundamental (RIF) reading program. This three part program includes three book distributions accompanied with motivational activities for children and parents; four specialized literacy trainings; and a special two-week reading campaign. Volunteers are needed to make our 2010 RIF Program the best ever. Family and community members will help Head Start children choose their very own book and following this the volunteer will read the story to the child. The RIF distribution dates are January 27, March 5, and April 19. The time for all distributions will be 10:00. The two week Reading Challenge campaign will run from February 22 to March 5. The goal is to double the amount of time our preschoolers spend with books by making reading aloud an everyday activity in both our center and the home. To meet that goal, we have challenged families to match our reading activity during the campaign, book for book. Community members will be reading books to the children during class at Head Start. Parents are challenged to read at least one book a day for two weeks. We can do even more. With your participation, we can make reading aloud happen three times a day. Volunteers are needed at the Woodbury Head Start. Please join us for story time by calling Lori Reed or Lynn Baxter at 563-5852.